Ribbon Cording is all about versatility. 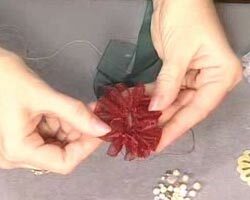 In this video segment, Judy Hendrix shows you how to make use of ribbon cording, as well as velvet and organza ribbon. This is a great product that hasn't reached its potential yet. It looks like ribbon, but stretches, and as you pull it apart, becomes a tube of thread made of wire. It comes in a variety of colors and changes the entire look of a ''strung project''. String a bracelet like you would normally do and then stretch the wire mesh over it, twisting in the ''down'' spots.--What an antiqued look! Suspend a rock--you wouldn't have to do peyote or netting to hold it in place. Velvet ribbon has an abundance of applications or functions. 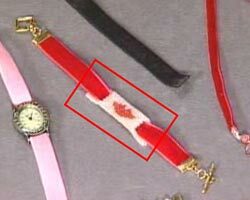 You'll probably remember these types of chokers that were popular at one time with a cameo hanging from a ribbon. This ribbon comes in 3 sizes and 17 colors--stretchy and non-stretch. Watches are the ''in'' thing. Look how easy this is to do. 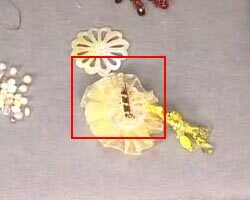 Take the pin type marcasite watch and run a length of the stretch velvet ribbon underneath the 1st pin, around to the back and up through the 2nd pin; make sure the watch is centered. 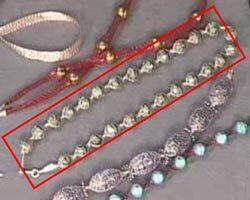 Use stretch for a little give, just like you would do in a necklace so you don't have to know exact sizes. Attach your clasp and you have a watch that is unique. Another item in the fashion industry is the personalized bracelet. 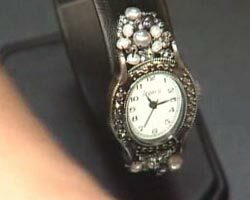 Draw up a quick peyote pattern and create a hole at both ends to run the ribbon through (similar to the watch). Add ends. 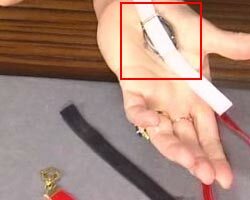 You can change these personalized bracelets like the ''initial'' bracelets you see. 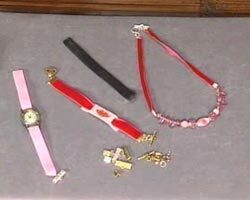 Take the smallest ribbon with no stretch (because of the weight that is in the center of the strung necklace). Add the smaller ribbon ends on both ends of 2 pieces. String the center portion of your necklace and attach it with jump rings and crimps. You might want to put some hypo-cement on the jumprings for added security. The fabric hypo cement works great on the ribbon too. Organza ribbon comes in 2 sizes: 1/4 inch and 1/2 inch in 12 colors. Brooch. 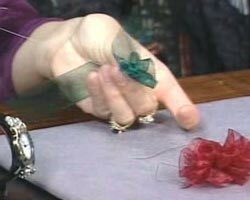 Gather the ribbon by doing a running stitch along the bottom edge of the ribbon and gently pulling it to ruffle. 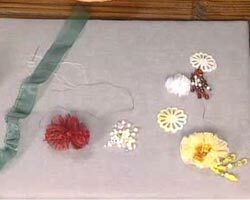 Sew the two ends together when the flower is full enough. 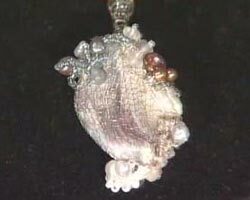 Using the mother of pearl backing sew on your dangles first. Attach the organza by going through the holes until it is secure. Add a second color of ribbon the same way and then apply pearls or accent beads in the center. 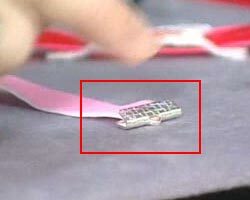 Attach a pin back by sewing through the holes. Decorate a small handbag the same way and you have a set. You can also create classic looks by adding a focal piece to the center of a ribbon and using a crimp hook for the ends (put a drop of glue inside first). 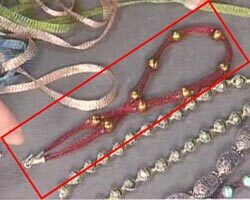 Combine the ribbons for an elegant ''prom'' necklace. Use the stretch ribbon for your base, add an organza flower off center and sew pearls or other embellishment beads for accents--glue on flat back Swarovski crystals and you have a new updated look.